The Altamesa Children's Home Ministry provides support to children's homes here in North Texas and beyond. 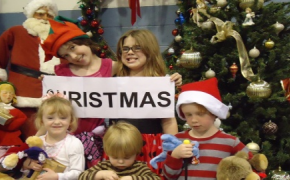 In December, Altamesa's Children’s Home Committee spends "Holiday Time" with the children. Every year, each child receives a gift from the church, and we enjoy lively conversations, beautiful singing, and games. Scrumptious desserts for the children are served. This time allows for us to get to know the children and express God's love and our love for them!